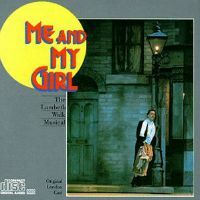 Broadway Cast, 1986 (MCA) (4 / 5) The Broadway transfer of the hit London revisal of Me and My Girl inaugurated the Marquis Theatre, located within a mammoth new hotel whose construction entailed the razing of several old theaters, including the venerable Helen Hayes and Morosco. 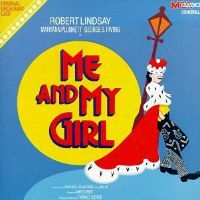 This may have predisposed many Broadway old-timers to hate the show, but Me and My Girl was so much fun that it was impossible to harbor any ill will toward it. Robert Lindsay repeated his West End role of Bill Snibson and received a Tony Award for his efforts. Maryann Plunkett, an utterly winning Sally Smith, also won a Tony. Among the old pros on hand in supporting roles are Jane Connell as Maria, Duchess of Deane; George S.Irving as Sir John Tremayne; Timothy Jerome as Herbert Parchester; and Justine Johnston as Lady Battersby. That superb cast, plus the fact that the CD booklet notes by musical theater expert Stanley Green are far more extensive than those for the London album, will make this the preferred recording of the show for many listeners, although some will want to check out the previous album if only for Emma Thompson. — M.P.